killer, and the prices are actually much lower than you’d think. I think the appatizers are better than many of the entrees. But the best thing they have going is their walnut/ pear/ gorgonzola salad. Get it and eat it! I love to go here on a sunny afternoon and sit on the patio. The pear and gorgonzola salad is to die for and so is their smoked salmon appetizer! Great selection of wines, as well beer and other cocktails. Sitting on the patio watching the boats and sipping a cocktail, doesn’t get any better than this! Could have been 5 stars but…….. While we were waiting for our table (party of 8) to be ready we were upstairs we ordered some drinks. My wife ordered a particular brand of chardonay and 2 others we were with ordered the house chardonay. When our drinks “finally” arrived the waitress told my wife that they no longer served that brand and brought her a glass of the house chard instead. She should have come back and asked first, but didn’t. We did wait a while for someone to even acknowledge us to order drinks. That being said, the food was great, the atmosphere was excellent and the views fabulous. Definately not your typical “tourist trap” kind of place (even though it may look like one from the outside). Casual but could still elegant if you want a “dress up” night. Being originally from Cape Cod and used to coastal restaurants with views and great seafood we were very pleased with this place overall and can’t wait for our next trip back to the coast. Crow’s Nest rocks! Service, food & bev. with great happy hour choices & prices. Upper lounge has choice ocean/beach views from all seats. Frequented by locals, yet no territorial attitude here! We’ve had dinner and /or lunch or just grog and pub grub in both the (lower-quieter) dining room or the upper lounge & outdoor deck – always had great food and great service. 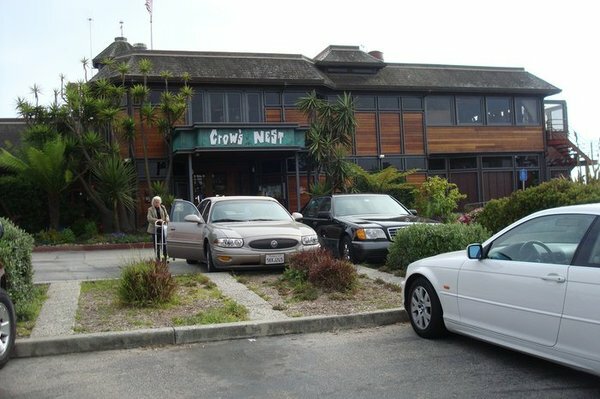 Kudos to Crow’s Nest & staff! This place is great. Try happy hour upstairs and after 6pm on Tues-Thurs for great deal. Great view. Most fun staff. Service is good enough. Chicken Sandwich. Fish & Choice. Both great. Fish sandwich was better when it was Mahi, not Tilapia. Get some grub and then walk around the harbor! How does this place only have an average 3 1/2 stars? Probably because it’s target market is family and those wanting a relaxed time. Anyhow, service was fantastic – our waitress must have read my mind. I was sitting in my seat after gulping a hot chocolate wondering if anyone around me had a glass of water and how I was going to get ahold of my waitress before I started feeling like I had cottonmouth –and a glass of water just appears right before me and our waitress said “Here’s your water” I swear to God I never uttered a word about wanting water! Anyhow, $15 for a well plated, sustainable choice of Alaskan Cod. That tasted delicious yet was just the right amount of food. We were there for two birthdays yet never announced anything to anyone. (Granted, we did place a reservation and I’m sure the person who set it said we were there for a birthday) Well our server brought out 2 slices of delicious chocolate mousse which the 4 us devoured. Go there for a Bday, the cake is yummy yum. And, of course, the view is nice. We did at one point think a seagull pooped in one of our beers though as were on the patio. If you have a paranoid fear of being pooped on by seagulls, don’t sit on the patio. Many reviews are from out-of-towners. I’m a local, and it is definitely a place enjoyed by many locals, especially in the off-season. I always enjoy the food, the drinks and the view. My favorites are the smoked salmon, which they do themselves, and the salad bar. Their enchiladas rock! Go to this place on a crowded summer weekend and you’re bound to run into the usual crowds, the usual waits — it’s expected, don’t complain! Chill out, have a martini, and fill your eyes with the panorama of Monterey Bay. I went here for my husbands birthday. The restaurant is really pretty inside which is nice for a special event or if you are from out of town. The entire restaurant is made of a dark beautiful wood, most of the restaurant is windows on one side so you can see the ocean. I think If I went back here I would go for lunch on a nice day and sit outside. The salad I had was one of the best caesars I have ever had and my husband loved the extensive salad bar but the good stuff stops there, None of the four of us were particularly blown away by the rest of the food. If your a tourist I would recommend it for lunch but between here and shadowbrook I would go to shadowbrook over this place. This entry was posted in All Capitola Restaurants, American Food Capitola Restaurants, Top Rated Capitola Restaurants and tagged crows nest, crows nest restaurant, harbor restaurants, santa cruz harbor, santa cruz restaurants. Bookmark the permalink. Santa Cruz Restaurants Your #1 site for everything about Santa Cruz Restaurants including Capitola, Aptos, Soquel, Santa Cruz Take Out Restaurants & Watsonville restaurants! Follow the Grills Guy On Hubpages to learn all about grills and grilling!